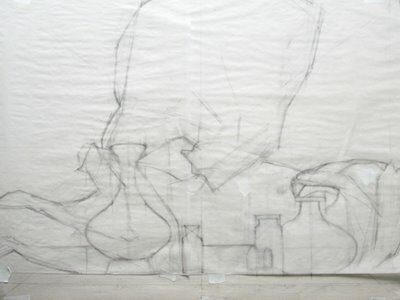 I'm working out a composition for a new painting on trace paper, and the new setup has several bottles and vases. 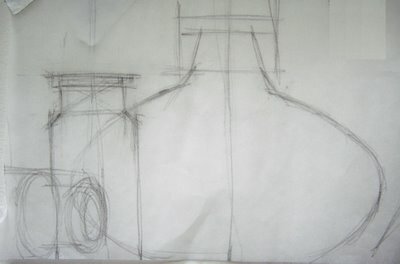 I thought I'd share how I draw manufactured, symmetrical objects, since they can be tricky. The least successful approach (as I have found out the hard way) is to try to draw a curvy contour and then try to match it exactly on the other side. 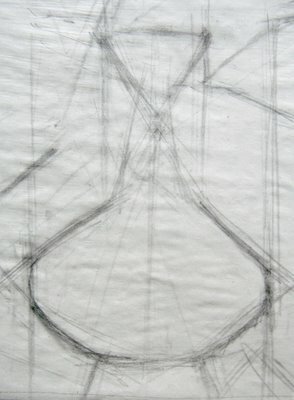 Instead, I start with vertical lines marking the center line, and the edges of the widest point and the edges of the width of the neck. Then I sketch a series of diamonds to mark the outermost contours. 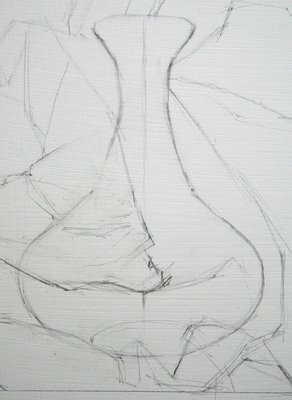 I also draw a lot of X's to see the relationships between the neck, body and shoulders of the vessel. Finally, I draw the ovals, circles, and rectangles that make up the compound shape. Only after that, I refine the contour. I try to be as precise as possible. Often there is a "lost edge" where the contour of the form recedes into shadow or is obscured by another shape. But I draw the entire vessel symmetrically even if part will eventually be hidden. Finally I check it by looking at the drawing over my shoulder with a mirror. Errors of symmetry will jump out immediately when seen in reverse. If the vessel in the final paintings is even slightly wobbly, crooked, leaning, or asymmetrical it will weaken the believability of the whole painting. I... confess... I have used tracing paper in the past to trace the contour of one side and then flip it over and use it to correct the other.